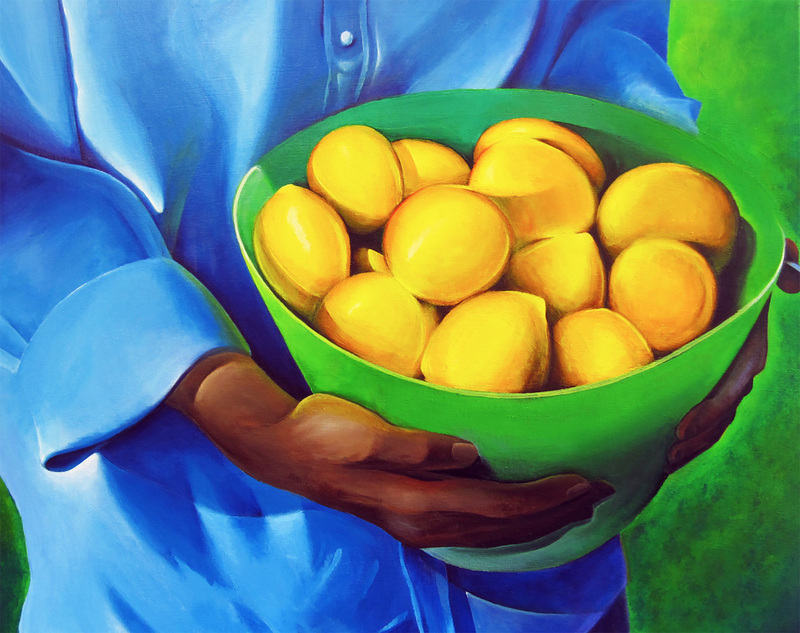 ‘The Lemon Basket’ painting was inspired by my mother-in-law, who’s always sending us boxes of lemons her lemon tree. During the time of Lent, lemons are a healthy supplement to a meat-less/vegetarian diet. Most of my professional career as an artist has been spent in the area of commercial art and editorial illustration. A lot of my concepts have been used to visually interpret or translate someone else’s thoughts or words into a visual form. Having started out as a fine artist, and I am returning home, so to speak, to spend more time putting my own thoughts on paper and canvas. My art reflects my desire to change the way we usually see everyday people, places and things. Currently, my inspiration is not so much what I paint, as it is, how I paint it – playing with the perspective or point of view, lighting, shadows, colors and textures in ways that allow the viewer to have a different visual experience – to feel the energy & spirit of my painting. The medium that I am using mostly, at the moment is acrylic. My substrates are canvas and masonite. Future works may evolve to include oil paint, oil crayons and other mixed media. A big influence, during my formative years as a college student at The Kansas City Art Institute, came from Shirley Schnell, my Foundations teacher. She challenged us “to walk through life sideways – try to view and experience things in a different way.” She wanted us to change the way we normally see and experience life, so to speak, and express that experience in our art – to look at, and visually express a different perspective/interpretation of the world around us. As a college professor, this is something that I try to pass on to my students as well. Other artists that I’m inspired by (whose styles or ways of visually thinking may not be visible in my work) include Bruce Holwerda, John Biggers, Charles White, Elizabeth Catlett, Laura Wheeler Waring, Henri de Toulouse-Lautrec, Aaron Douglas, Ivan Powell, Reynolds Ruffin, Thomas Blackshear, Don Miller, A.M. Cassandre (Art Deco) and Lawrence Ware, my high school painting teacher, to name a few. George Tuggle was born in Oklahoma City and raised in Evanston, Illinois. He earned a Bachelor of Fine Arts in Graphic Design at The Kansas City Art Institute, and received his Master of Fine Arts Degree in illustration from Syracuse University. He has also studied at The School of The Art Institute of Chicago and The School of Visual Arts in New York City. After college, he worked as a commercial artist. For several years now, he has turned his attention back to where it all began for him with his first love as a fine artist; he’s spending more time drawing and painting. His style is not only the subject he chooses to draw or paint, but the perspective, or point of view that he wants to paint it from. “I like to change the way we see what we see. I enjoy making the viewer feel like they’re in the environment by painting my subject matter large and close up, either from above or below my subject matter in attempt to change the way we would normally see and experience everyday people, places and things.” In addition to teaching illustration courses at Towson University in Baltimore, he has taught drawing and illustration courses at Bowie State University, Prince George’s Community College, The Art Institute of Houston and The Maryland Institute College of Art in Baltimore. George is a member of the Illustrators Club of Washington, DC.